Kathy is an attorney in Brown Rudnick's Real Estate group with over 30 years’ experience. She counsels clients on real estate transactions, including retail, office and industrial leasing, and the acquisition, development and financing of real estate projects. She also advises retailer businesses on a variety of other legal matters. 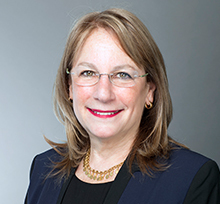 Prior to joining Brown Rudnick, Kathy was Senior Counsel at Bed Bath & Beyond Inc. for thirteen years, handling the public company's leasing, acquisitions, lease management and environmental compliance matters. As such, she provided both legal and business counsel in all real estate matters for the company’s brands, including oversight of outside counsel in lease negotiations, legal support for real estate directors, construction and facilities departments, store and warehouse operations, and lease administration, providing her with broad knowledge and understanding as to the operations and needs of global retailers. Prior to that, Kathy was an Associate, Partner and Counsel at several New York City law firms where she concentrated in office and retail leasing, real estate acquisitions, disposition and financing, as well as the conversion of New York City rental properties to cooperative and condominium ownership. Kathy represented the National Sales Center of the Resolution Trust Corporation disposing of multi-asset portfolios of under- and non-performing assets taken over by the United States government from the failed savings and loan industry. New England School of Law - J.D.